This crazy little project consists of mounting a small computer in my Jeep as well as wiring the system in to the factory stereo system. 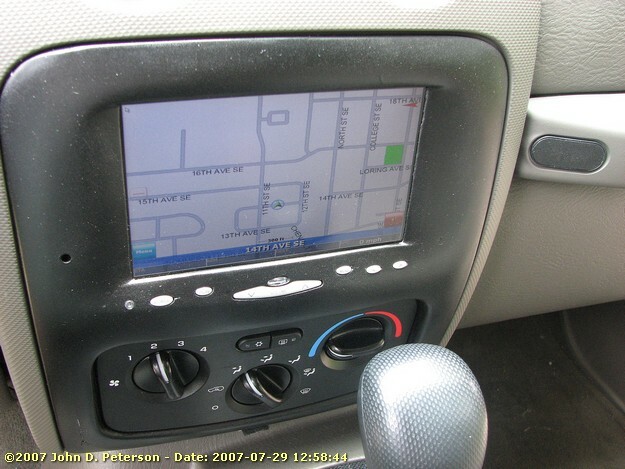 A few of the uses I have for the project include GPS navigation (never have to ask for directions again! ), have my complete MP3 audio collection available at all times and to use the PC to aid in some of my other hobbies such as data radio monitoring. What a better way to combine my interests in computers, cars/car audio, radio gear and railfanning! I have already been through one nearly complete iteration of this project since starting it. My first PC was a VIA EPIA V10000 Mini-ITX motherboard with a 1 GHz Via Nehemiah Processor. This was a pretty good system but seemed underpowered to me as the processor was often running at least 60%-100% usage for tasks I was using it for. I have since rebuilt the system with a JetWay J7F3E-PB Socket A Mini-ITX AMD Motherboard. This board features an AMD Geode NX 1750 (1.4 GHz) mobile processor and absolutely runs circles around the VIA motherboard. This new system hardly breaks a sweat now! Along with the JetWay motherboard, the system has 512MB of DDR RAM, an 80 GB laptop hard drive and a Linksys WMP54G PCI wireless network card. 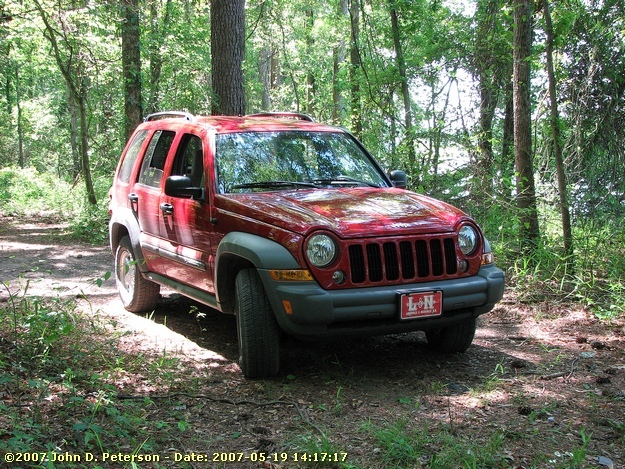 Here is our project vehicle, my 2005 Jeep Liberty Sport, shown here "getting dirty" out on the Wheeler National Wildlife Refuge. I have been very happy with this SUV. It is certainly enjoyable to drive and can get in some places I could have never gotten with a car - which can come in handy when railfanning! Here is a basic schematic of the system including the PC and peripherals as well as the radio gear I use for railfanning, etc and the audio equipment (I hope to expand on the sound system in the near future). A project like this requires a fair amount of fabrication to make things fit in to places that they were just never designed for! On the other hand, that is part of the fun! My first iteration of this project had the motherboard mounted in a homebrew plexiglas case. This looked nice but interference from the motherboard was causing lots of problems with my radio gear. I found this old electrical box at a local electronic supply house and modified it to mount the motherboard in. 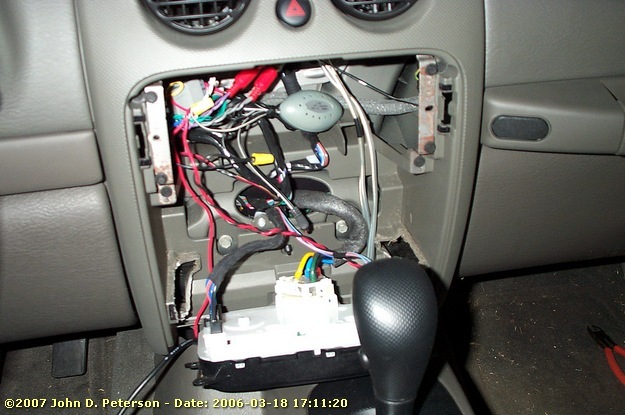 This provided a shielded case and cut down on the radio interference. Consequently, the new JetWay board doesn't produce the same radio interference that the VIA V10000 board did but it is definitely staying in the grounded, metal chassis. Here is a shot of the internals of the PC. From right to left is the JetWay motherboard, the M1-ATX automotive power supply, the 2.5" laptop hard disk (barely visible under the power supply) and the power connections. I have two 80mm cooling fans mounted in the top of the case to provide cooling on those hot days in the South! Here is the factory dash radio and heater controls. I have already cut some of the plastic structure out in order to move the heater controls down about 1.5". 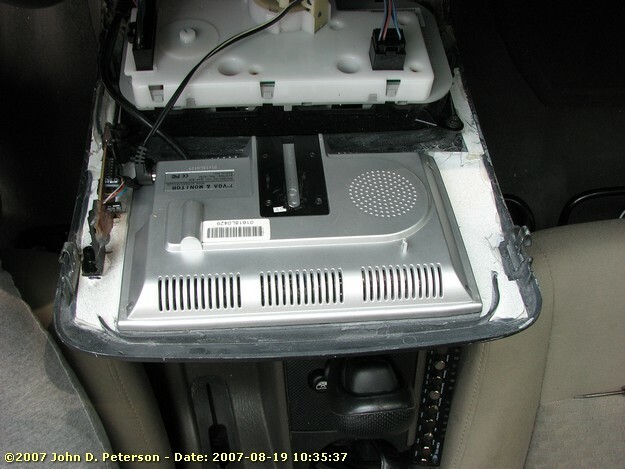 This allows room for the 7" Liliput LCD monitor to be mounted where the radio is. 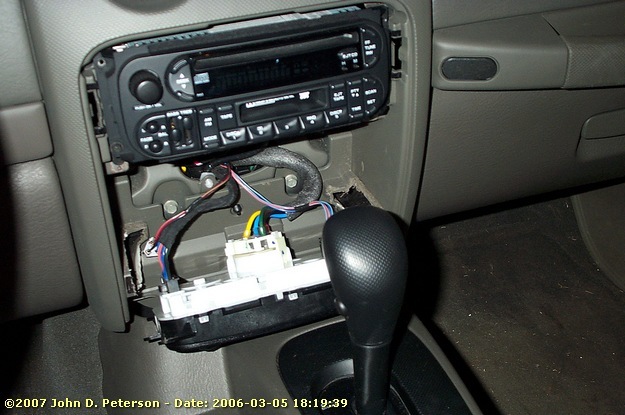 I did lose the factory radio with this project but I have added back Sirius satellite radio as well as an AM/FM USB radio to the system so I really didn't lose anything. Here is a shot with the wiring in place for the monitor and other equipment. 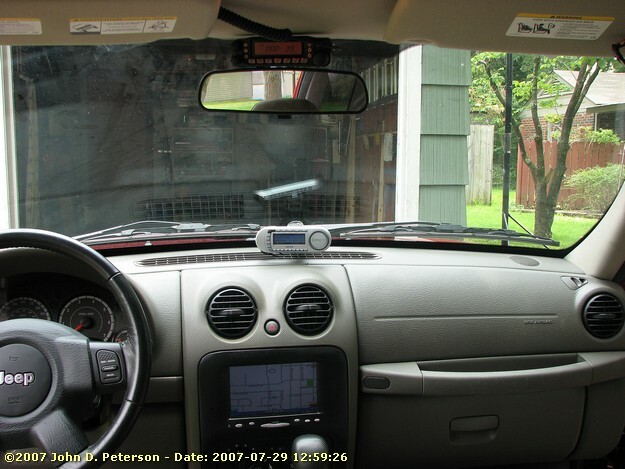 I have the Griffin RadioShark mounted in this area behind the monitor and have connected its antenna to the Jeep's factory radio antenna. Sadly, the reception is nowhere near as good as the factory deck, but I don't listen to over-the-air AM/FM a whole bunch unless there is news or traffic issues. 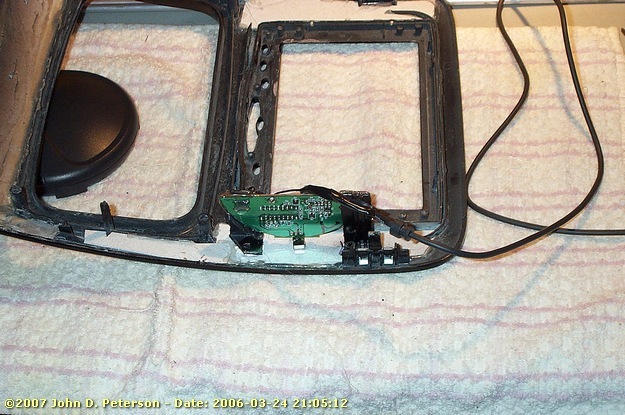 To retain a "factory" look, I wanted to mount the 7" VGA monitor in the dash where the radio was located. I took the plastic bezel and moved the heater cut-out about 1.5" lower and glued the front face of the monitor in place where the factory radio was located. 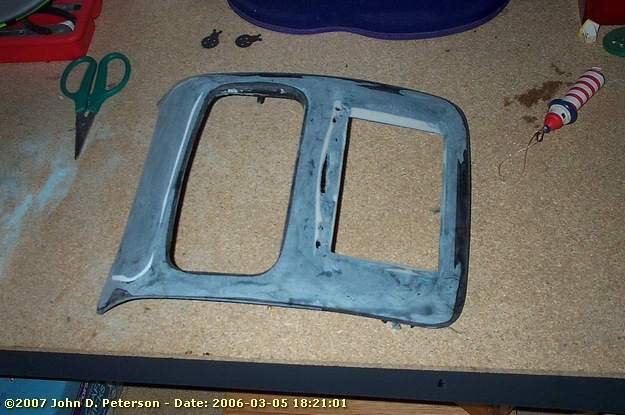 I used scrap plastic to fill in as many holes as I could, then used fiberglass embedded body filler to fill in the small holes and smooth out the bezel. 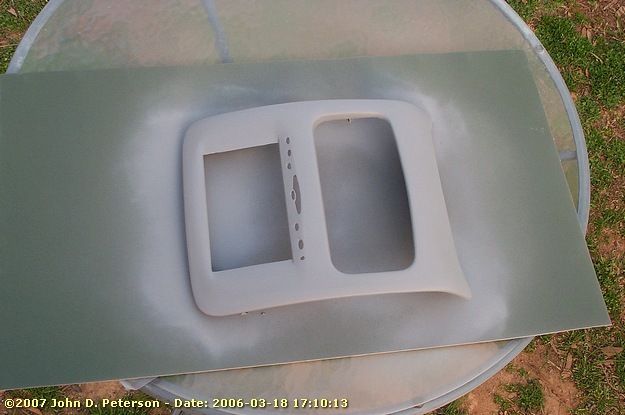 Here is the bezel with the first coat of primer after lots and lots and lots of sanding. Did I mention there was LOTS of sanding to do to get a smooth surface? Now that the bezel is getting closer to ready to install, I fabricated some small plastic brackets to hold the circuit board from my Creative Labs Infrared Remote Control receiver. I then drilled a small hole in the bezel for the IR receiver. The IR receiver connects to the CarPC via a standard serial COM port. Here is a shot of the final bezel being installed. This shot shows the back of the 7" monitor as well as the infrared receiver. Also visible is the small strips of plastic used to fill in some of the spaced before applying the fiberglas/body filler. Now, we start actually installing equipment in the car. The PC is about ready to install under the passenger side seat. I have run all the wires and cabling for the system. The audio preamp/equalizer is visible at the top of the photo. 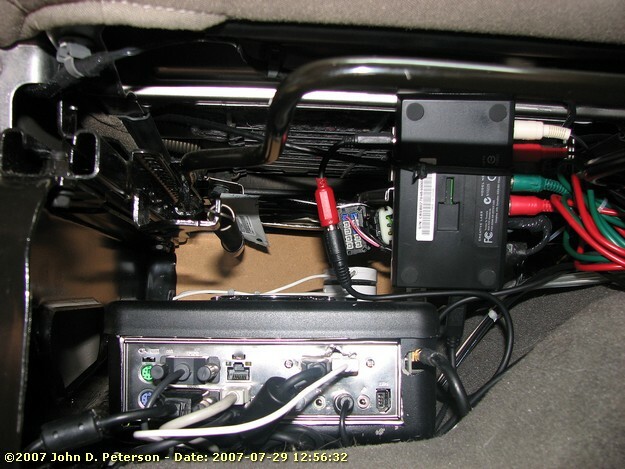 Looking under the passenger side seat (towards the back of the Jeep), we can see the PC in place. 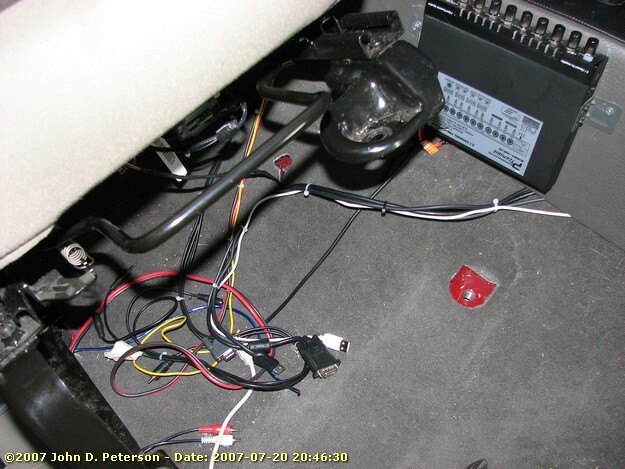 The SoundBlaster USB sound card is "zip-tied" to a metal bracket under the seat. I chose this card because it has RCA inputs and outputs which I feel like gives a better connection than the small 1/8" audio plugs. 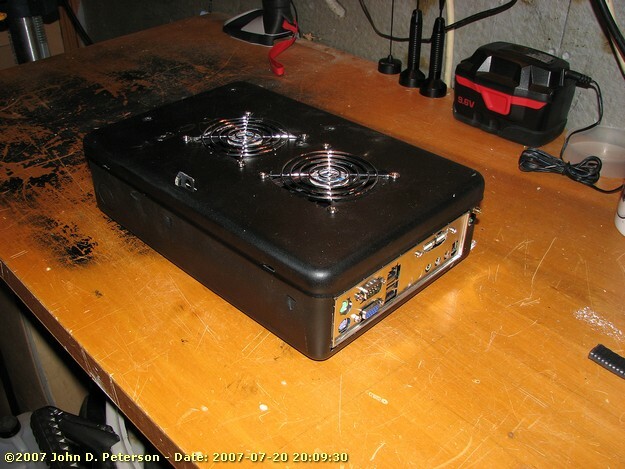 The white disks on top of the PC case are Griffin iMic USB sound cards used for data radios. 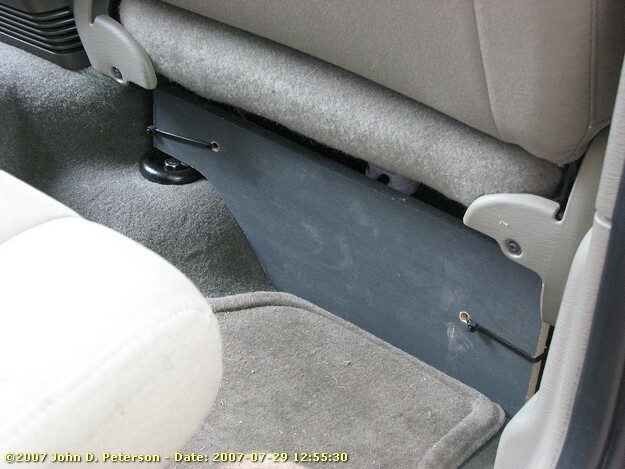 I installed this "kick panel" under the rear of the passenger side front seat to protect the PC and wiring from peoples' feet when sitting in the back seat. Here is a shot of the finished bezel with the heater controls and 7" LCD monitor. The small hole on the left side is for the infrared remote control. Using software such as UICE, codes from the IR receiver can be translated in to Windows actions. I am always tinkering with programming various buttons, etc to do operations like swap between open windows, change the volume, skip through an MP3 playlist and launch applications. Most of the time, I never even need to take the mouse or keyboard out. 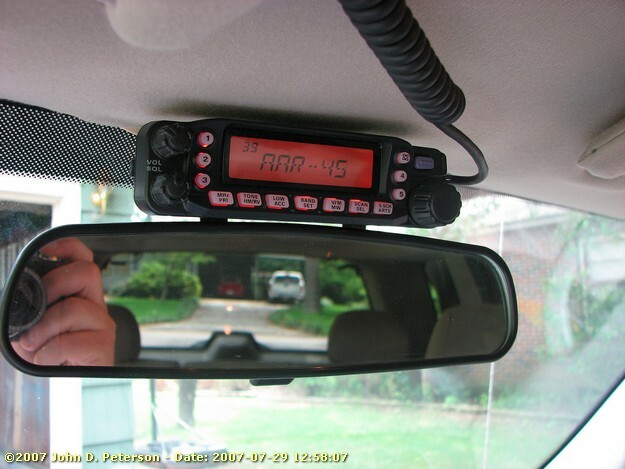 Here is an overall shot of the dash, etc showing the 7" LCD monitor, the Sirius Satellite Radio receiver and the rear view mirror mounted head unit for my Yaesu FT-7800R ham radio (with the mic tucked over the visor for now), which doubles as a scanner while railfanning. 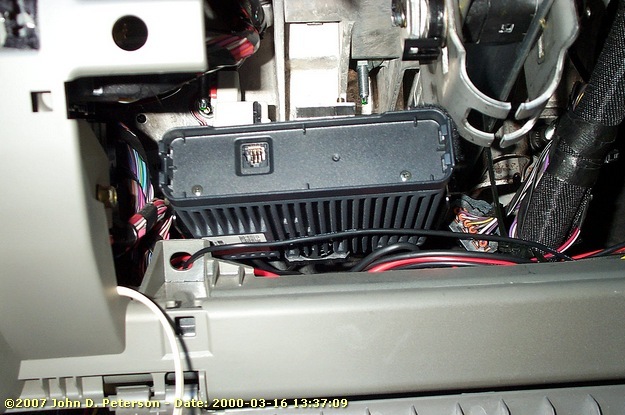 The body of my Yaesu FT7800R is mounted under the dash next to the steering column. The auxillary speaker output is run through a homebrew speaker to line level converter and then in to the mic in on the PC sound card. This way, the audio from the FT7800R comes through the main system (great for having enough volume while riding with the windows open). 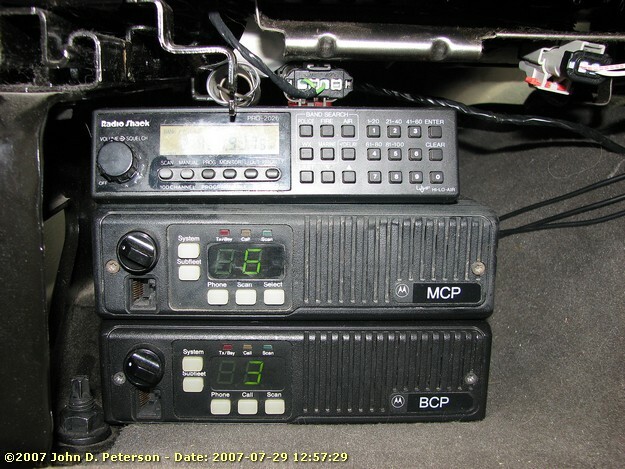 The radios used for data monitoring are mounted under the driver side seat and consists of a Radio Shack PRO-2026 scanner and two Motorola Maxtrac radios. 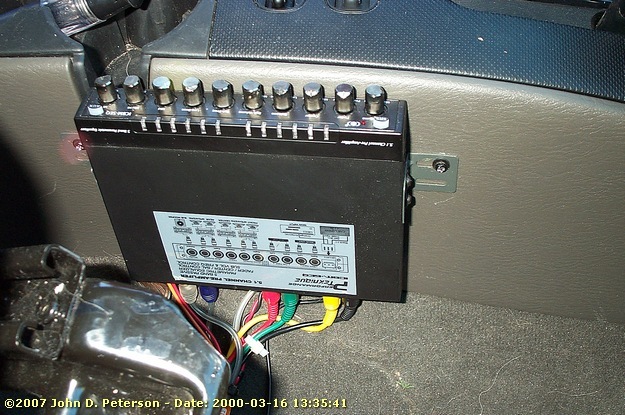 I may put a "kick panel" on the back side of the driver side seat but I do need to leave access to these radios as I often will change channels, frequencies, etc on these. Here is a close up of the head unit for the Yaesu FT-7800R dual band ham radio. The mic is currently tucked over the visor but I hope to come up with something a little more permanent . 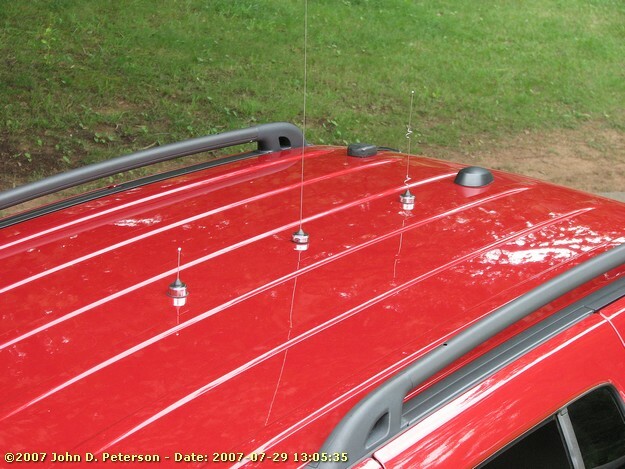 Here is an overall shot of the antennas mounted on the roof of the Jeep. From front to back (left to right), the first antenna is a 900 MHz unit for radio data monitoring, the next is a VHF whip for the ham radio and the last whip is a 2.4 GHz model which connects to the WiFi card of the PC. The black "bump" directly behind the wifi antenna is the factory Jeep Sirius satellite radio antenna. I modified the cable to allow me to use this factory antenna with my aftermarket receiver. 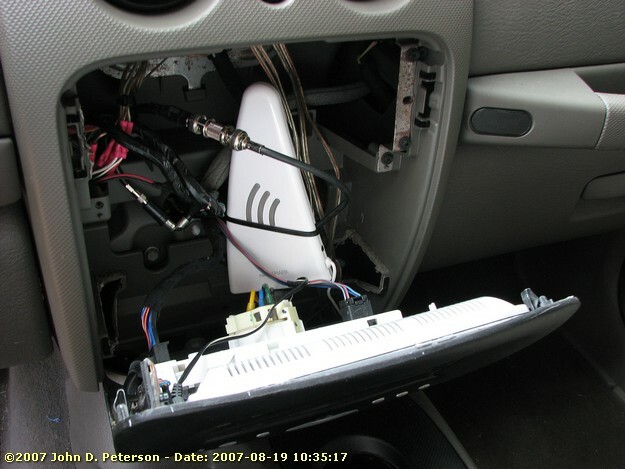 The small black "square" on the passenger side (visible between the VHF and wifi antennas) is the GPS unit. Currently, the SoundBlaster USB sound card is the primary audio device in the system. The line out from the SoundBlaster card feeds this multiband equalizer/preamp. I really didn't need this unit, but it allows me to control the volume, fade, balance, etc without doing it on the computer. 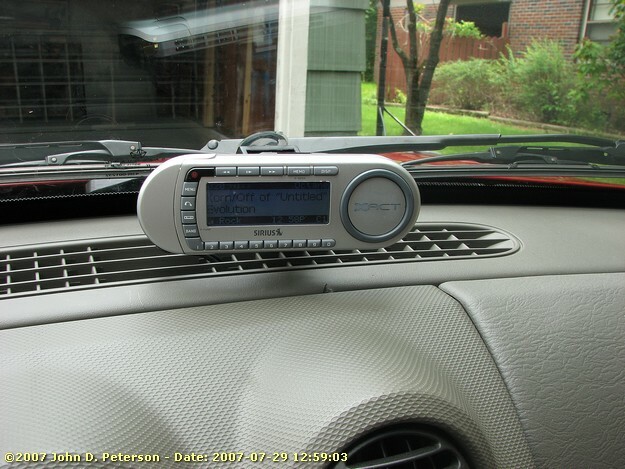 The aftermarket Sirius satellite radio receiver mounts above the dash with a suction cup type mount connected to the front window. The audio output of this receive feeds the Line In of the USB sound card which then connects to the factory stereo system. Currently, the output of the sound card goes through a preamp/equalizer then through a small 4-channel Sherwood amplifier. I plan to add on to the audio system in the near future and will update this page when I do! Located behind the monitor/heater controls is a Griffin RadioShark used for AM/FM. I modified the unit (notice the coax coming from the back of the "fin") to connect to the factory Jeep antenna. The reception is not real good with the RadioShark so I plan on adding an FM signal booster to help.